I’m a little late in posting these peach roses as it has been back to school for my son this week, and that has meant I’ve been running around with lots to do to get him sorted and ready. 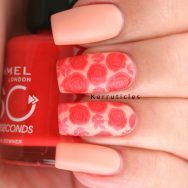 These nails are for the 40 Great Nail Art Ideas group, where the colour prompt was peach or lemon. My own theme was roses. I’ve done quite a few yellow manicures recently, so I chose to go with the peach and did some reverse stamping. The base is Beauty UK Peach Melba. It took three coats as it was hot and humid when I painted my nails and they got some small air bubbles in the first coat, so I chose to go over them a little more to hide the bubbles. The stamping polish is one I picked up in France recently while I was on holiday. We were visiting a “night market” in Surgères when I came across a stall full of stamping supplies. The brand is Ongle Amor, and I think it’s some sort of franchise as there seem to be lots of outlets selling their polish and plates online and at fairs and markets around France. There was a good range of stamping plates, with lots of different designs, but I didn’t buy any as they weren’t backed. Stamping polish was another matter though. They were demonstrating stamping to some young girls and the polish looked good, so I bought five bottles for €20 (about £17). 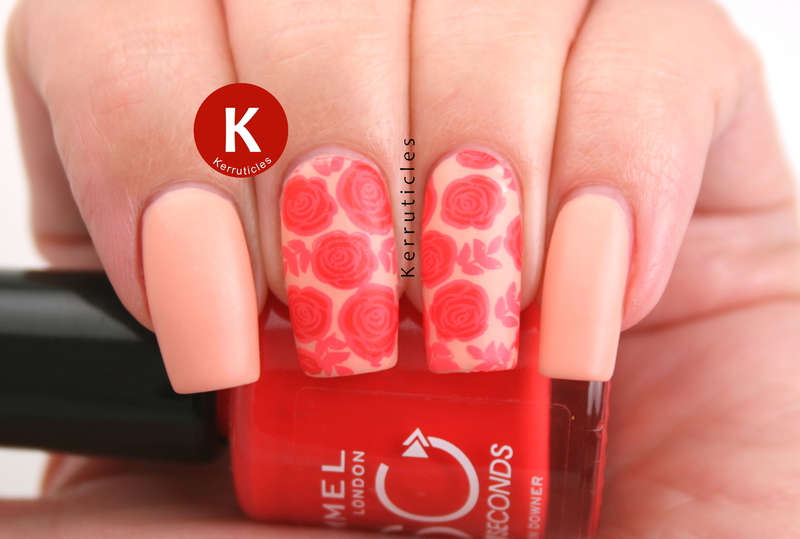 I have used “Color 74” Rose Baby here and an image from Born Pretty Store BP-73. 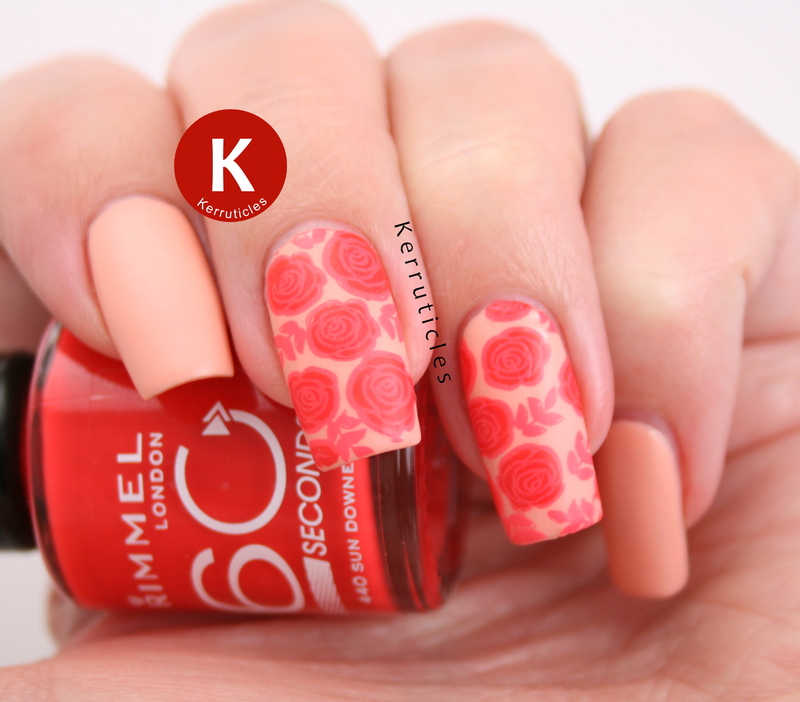 The roses are filled in with Rimmel Sun Downer, an orangey-red. Since the colour differences are only slight, I mattified the manicure to allow my camera to pick up as much detail as possible. These peach roses are super gorgeous!